My first stop at most parties is the appetizer table. Ninety percent of the time, the same dishes appear and most of them are not part of the Mediterranean Diet: crackers with 3 different types of cheese; chips with dip; a vegetable platter; kielbasa with mustard; deviled eggs; and of course shrimp cocktail. I used to love shrimp with tangy cocktail sauce, but I have had so much of it over the years that it’s lost it’s appeal. 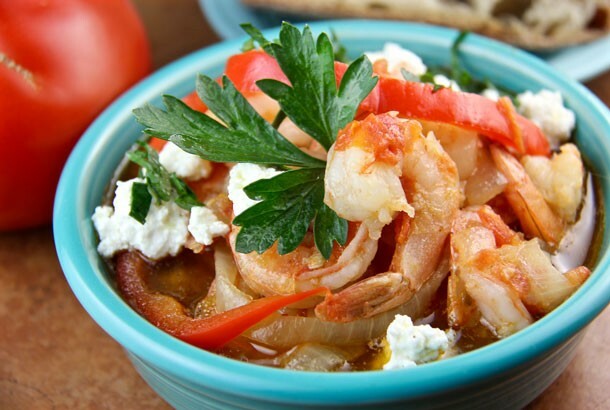 Luckily for us, Koula Barydakis has given us a traditional Greek shrimp recipe that made me love shrimp again! This recipe works as both an appetizer or as the main dish. When I have it for dinner I pair it with greens (horta) and potatoes and white wine. I think you will find this to be an amazing new way to cook shrimp that will add new flavor to both your parties and dinners. In a large frying pan, sauté the onion, pepper, and garlic in olive oil for 5 minutes. Add the tomatoes. Simmer for 15 minutes. Add the shrimp and cook on medium heat for 10 minutes. Add the feta and simmer for 5 more minutes. Salt and pepper, to taste.